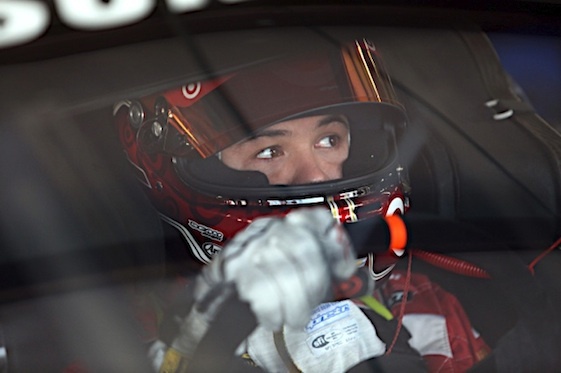 Rookie Kyle Larson definitely is back in his groove. The Chip Ganassi Racing driver, who started the season in impressive finish but sank into a mid-season funk in terms of finishes, won the pole Friday for Sunday’s Sprint Cup Series race at Pocono Raceway. Larson, who turned 22 on Thursday, set a track record of 183.438 mph in qualifying for Sunday’s GoBowling.com 400. “I felt I hit all three corners about as good as I could and barely edged out Joey (Logano) – which feels great because he’s been fast in qualifying,” said Larson, coming off consecutive top-10 finishes at New Hampshire (third) and Indianapolis (seventh). Larson’s effort wasn’t lost on Logano, who turned the fastest lap in each of the first two rounds of qualifying and finished just eight thousandths of a second slower in the deciding session. “Kyle definitely laid down a good one because I thought my lap was damn near perfect and I got beat,” said Logano, who posted a top-10 qualifying effort for the 17th time in 21 races this season. Although still seeking his first win, Larson’s recent performances have him in position to qualify for the Chase for the NASCAR Sprint Cup. He’s 12th in Sprint Cup points, three points ahead of Austin Dillon, his primary competition in the Rookie of the Year battle. Dillon, who won the season’s first pole at Daytona, qualified 11th on Friday. Larson has nine top-10 finishes this season. The 2013 Nationwide Series Rookie of the Year, Larson finished fifth in the June 8 Pocono 400, the first Cup race in which he led laps this season. He’s led laps in three of the ensuing six races.